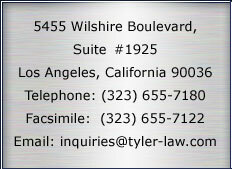 Tyler & Wilson has a diverse and sophisticated litigation practice. We focus our representation on the practical as well as cost-effective and, if appropriate, aggressive resolution of disputes. Our approach to litigation utilizes the full spectrum of skills our various attorneys possess to the benefit of our clients. Tyler & Wilson has extensive litigation experience in: Corporate and Business Litigation, including breach of contract and business disputes in state and federal courts; Administrative and Regulatory Litigation in all arenas, including departmental administrative hearings and formal administrative law venues as well as superior and appellate courts; and Labor Litigation including matters before the Department of Fair Employment & Housing, the Equal Employment Opportunity Commission and the California Labor Commissioner actions as well as before superior and appellate courts. Tyler & Wilson litigators evaluate actual and potential cases at the earliest stages to first determine if extensive litigation can be avoided or, if not, if the matter can be best resolved quickly and economically. To this end, Tyler & Wilson attorneys are fully familiar with a wide array of alternative dispute resolution techniques, including arbitration and mediation. However, when necessary, Tyler & Wilson attorneys will take matters to trial or up on appeal if it is in the best interest of the client to do so. For information about our firm and its lawyers and/or assistance with your litigation needs, please contact any member of Tyler & Wilson, LLP directly or email us at Inquiries@Tyler-Law.com.